Ernest Borel was founded in 1856. They set up their first factory in 1859. 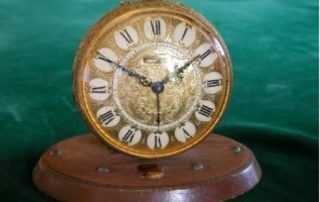 In 1959 to commemorate their centenary they produced the” Versailles”, a small alarm clock in the style of a Louis XIV watch. The movement is an Arogno Cal. 22N, a 22 ligne(49.6mm) 15j. 8 day time and alarm. The casing is quite spectacular and versions were made with cartouches white on black and black on white. It is in the form of a large pocket watch with opening back and alarm control through the pendant. These clocks are not uncommon but what makes this one unusual is its original commemorative stand with the Borel logo.